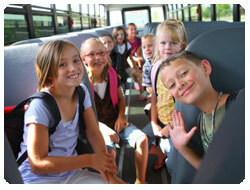 School Transportation Services: As budgets tighten, school districts are looking for ways to decrease costs. A proven and effective way to do this is to outsource transportation needs to Birnie Bus Service, Inc. However, there are many reasons why a school district may choose to outsource it's transportation needs. Contain & reduce costs of operating a bus fleet. Replacement of an aging bus fleet. Improved & lower cost of maintenance & repair. Improved driver training & safety. To meet challenges in specialized transportation services such as handicapped transportation. Keeping up with new state and US DOT operating regulations. Reducing liability and customer service issues with parents and community members. Birnie Bus Service, Inc. provides to school districts, customized student transportation solutions to fit each individual schools needs. Privatize... for the Kids, of course. Embrace Privatization to Cut Costs, Focus on Education. For more information about Birnie Bus Service, Inc. school & schoolbus services please Contact Birnie Bus Today. You should never pass a school bus when it's stopped or the lights are flashing.